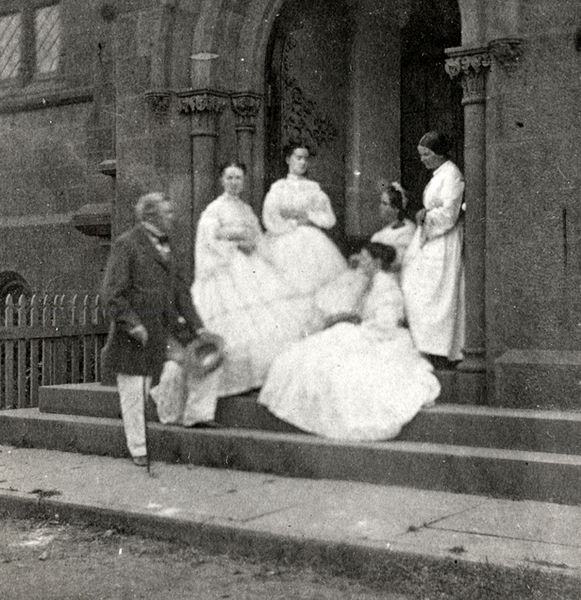 “Henry family at east door of Castle,” Histories of the National Mall, accessed April 25, 2019, http://mallhistory.org/items/show/456. Joseph Henry, the first secretary of the Smithsonian, and his family lived in the Smithsonian Institution Building, also called the Castle, from 1855 to 1878. This photograph, taken in 1862, shows Mr. Henry along with the whole family: Harriet Alexander Henry, his wife, and daughters Caroline, Mary, and Helen. The fourth woman may be a relative or family friend.